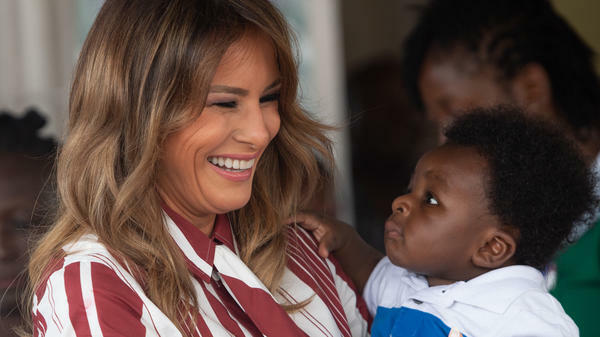 Melania Trump handed out blankets and made faces at babies at the Greater Accra Regional Hospital in Accra. 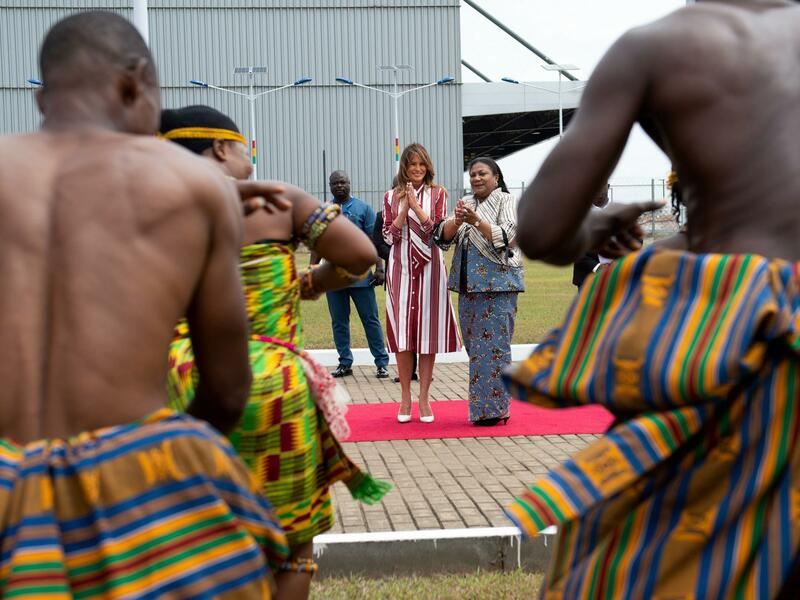 First lady Melania Trump and Rebecca Akufo-Addo, the first lady of Ghana, watch traditional dancers after Trump landed in Accra to start her weeklong trip in Africa. According to the pool report from New York Times reporter Katie Rogers, Trump accepted a bouquet of flowers wrapped in kente cloth from an 8-year-old girl named Lillian Naa Adai Sai "who looked rather starstruck as she gazed up at Mrs. Trump." A red carpet was rolled out and the first lady of Ghana, Rebecca Akufo-Addo, greeted Trump, along with dancers, drummers and small children waving flags. "Thank you very much," Trump said to her counterpart. Much has been read into Trump's choice of Africa for her first overseas trip without the president, especially among those who imagine her every move to be one massive subtweet of President Trump. Earlier this year, Trump referred to African nations as "s***hole countries" during a closed-door meeting with senators about immigration. According to the White House, the first lady's trip will focus on learning about what the United States does to help other countries become self-sufficient. "Her trip will focus on maternal and newborn care in hospitals, education for children, the deep culture and history woven into each African country, and how the United States is supporting each country on its journey to self-reliance," said a statement about the trip released last week. From the airport, Trump traveled to the Greater Accra Regional Hospital. There, she passed out teddy bears and blankets branded with her "Be Best" slogan, which she has chosen as the theme of her work as first lady. Per the pool report, "as the first lady helped pass out blankets and bears, she picked up a chubby-cheeked baby and made faces at him, to the delight of the assembled mothers and hospital officials." "Congratulations," she told one mother breastfeeding her child as she handed her a blanket. While at the hospital, Trump also watched a 6-month-old baby boy get weighed as part of a wellness check. "Healthy boy," she pronounced. And she visited the neonatal intensive care unit in a new wing of the hospital where babies with more challenges receive care. As with most travel by first ladies, this trip is expected to be light on policy and heavy on photo opportunities. Next stop: tea with the first lady of Ghana.